In this article, i have compiled all of the questions that i am asked most often about analytics job market. I am a mechanical engineer having 3 year of experience as project manager in the IT industry. Can you please guide me how can i get into analytics field? I have an academic background in statistics / mathematics / economics with no experience. How can i get a job in analytics industry? I have about 3 years of experience in the field of financial reporting and now want to shift to predictive modeling. Is it possible? Should i learn SAS, SPSS or R? The Advanced and Predictive Analytics (APA) software market is estimated to grow from $2.2B in 2013 to $3.4B in 2018, attaining a 9.9% CAGR in the forecast period. [IDC Report]. A top management consultancy firm, Mckinsey predicted shortage of analytics professionals in next 4-5 years. "By 2018, the United States alone could face a shortage of 140,000 to 190,000 people with deep analytical skills as well as 1.5 million managers and analysts with the know-how to use the analysis of big data to make effective decisions". Which software should i learn - SAS or R? As per IDC survey, SAS is the top supplier, owning 35.4 percent market share of the 2013 advanced and predictive analytics market, more than twice that of the next-closest competitor. In addition, the IDC report ranked SAS among the top five providers with the highest growth rates in advanced and predictive analytics software. SAS is an expensive tool but it is nothing to a bank or a drug company. Moreover, many companies have been using SAS for 30 years, and they have automated the whole process of analysis and have written millions of lines of working code. To convert all the stable reporting system from SAS to R, it may cost 50-100 times more. SAS has outstanding support system. They provide tech support within few hours of raising a ticket. SAS is the first choice for a large company especially BFSI (Banks,Financial Services and Insurance) and pharmaceutical companies as they can afford to invest that much in their reporting and analytics. R is free. Anyone can download it. So far, it has been chosen by more than two million data scientists and statisticians around the world. R Studio and Revolution R software gives better interface to R functionality. R creates awesome graphics. R is used frequently by The New York Times to create infographics and interactive data journalism applications. R makes machine learning algorithms and text mining techniques so easy to implement in a predictive analytics project. Because most cutting-edge research in statistics and machine learning is done in R, the latest techniques are usually available first as a package for R, years and years before they appear in other paid statistical packages. R is the first choice for a start up and core data science company. It is mainly used in conjunction with SAS in most of the companies. Summary : If you are a beginner to analytics world, you should learn SAS as there are more SAS jobs in the market as compared to R. If you know SAS already or you want to learn machine learning algorithms or text mining, you should learn R. In most of the large companies, SAS is a primary tool and R is a secondary tool mainly used for implementing text mining, graphics and machine learning algorithms. Refer books on statistics mentioned above. Topics to be prepared : Measures of Central Tendency, Significance Testing (ANOVA, T-Test, Chi- Square), Linear Regression, Logistic Regression Analysis, K- Means, Principal Component Analysis etc. Learn programming of SAS/R. 100+ SAS Tutorials 50+ R Programming Tutorials. Mention research project on your CV. The project topics for predictive modeling is mentioned in the latter part of this article. If you are working in an IT company, try to get internal job posting in a market research or analytics department. See Analytics companies in India. Probability of default to determine if borrowers are likely to default on their loans. Carry out a data discovery task concerning understanding the behavior of customers of a broadband service provider of UK who unsubscribe/churns. The analysis is based on complaints, billing, product and usage limit data. Exploratory data analysis, outlier treatment and missing value treatment were carried out to prepare a master data set combining all sources of data on customer level. Using logistic regression identify factors / attributes driving churn. Segmentation and profiling of subscribers based on likelihood to churn is done for prioritizing customer segments and formulated proactive retention strategies. Suppose you have a questionnaire consisting of 115 questions about employee engagement. You need to shorten the questionnaire by identifying redundant questions and eliminate them and group the relevant questions. The United States Department of Agriculture (USDA) collected a dataset containing all plants (species and genera) and the states of USA and Canada where they occur. They want a summarization of the plant information. The data is in the transactional form. You are asked to provide USDA a summarization of their plant database. 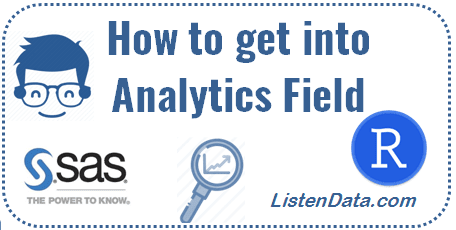 41 Responses to "How to get into Analytics field"
Very Nice.. I will Post my improvement within a month... thanks..
Great! I am waiting for March 03,2015 :-) Let me know if i can be of any help. thanks a lot for your article. I found what i was exactly looking for. and 'For Advanced Users - Analytics'. why is statistics a predecessor/prerequisite for analytics.this has gotten me thinkng as to where am i rite nw. i 4 1 knw dat i am nt an analyst as of nw. theres a lota data culling, reporting using various ODS , data integration from various sources happening in my role. we dnt use graphs or ny of the modellngs etc... which is analysis. P.S : sending across tons of appreciation for all the topics relating SAS u hv covered.of all that i hv read,i found alomst 100% usefull. Please keep up the grt work!. Thank you for writing to me. Yes, it all depends on the job profile. Still it's good to have basic knowledge of statistics even if you are not in statistical modeling profile. People who know statistics know how to generate insights from data in a computationally efficient and statistically effective manner. Really useful article for SAS Beginners...cheers!!! I am a Economics graduate and MBA-IT PG. I am a fresher and planning to do Data Scientist Course from SAS institute. Many people told me that as I dont have technical knowledge it is useless for me to get into SAS. I am confused now. Can you please suggest. Thank you for writing to me. I am also an economics graduate. I have never studied SAS programming during graduation. I would suggest you to go for data scientist course. Thanks Deepanshu its a great help. Hi ,I am homeopathic doctor can I do this SAS? My brother did BBA, MBA. Can he do SAS? Hi, i have 2 years of experience in Client servicing, i have done MBA 2015 passed with Btech(CS). I studied Statistics subject in MBA. I want to know that i searching SAS Fresher opening, every company is asking 1-3 years experience in SAS Base, Macros and SQL. I have good knowledge about all these. But i am fresher in SAS to enter into any company.I searching for SAS fresher, could you please guide me in this issue. I apologize for the delayed response. In analytics, companies generally prefer professionals who have at least one year of experience in analytics field. Hence, there are a very few openings available for freshers. Most of the freshers working in analytics companies were hired from campus drive. Even if you are into different profile, I would suggest you to gain knowledge of SAS programming by practicing SAS coding in dummy datasets. This way, you will be able to crack SAS interviews and get a SAS profile. Also, you can test your knowledge on real world datasets that are listed in the article above and add to your CV. Hi Deepanshu, I have 3 years of work experience into mortgage domain and recently I cleared base SAS certification. Want to make my career into Analytics. Please help how to get into it. I would suggest you to test your knowledge of SAS programming by practicing SAS coding on real world datasets that are listed in the article above and add to your CV. Thanks! Thank you for stopping by my blog. The scope of data science for Phd holders is immense. I would suggest you to learn basic and advanced statistical techniques and machine learning algorithms after you completed Base SAS course. It would make you more marketable in job market. Hi, I have completed mca, i tot doing course in sas or data analysis and I'm bit confused which course I sud take up and I don't know the knowledge of statistics and data analysis. plz guide through this. Thank you. If you don't know basic concepts of statistics, you can learn these concepts. You have to decide whether you want to become a programmer or statistical analyst. Knowing SAS can help you fetch a SAS programmer profile. To crack interview for SAS Modeling profile, you have to learn basic and intermediate statistical concepts. I have 5+ experience in .NET. Can learning hadoop, etl, hive data analytics land me to better job. Please help me. I am very confused to switch my field from developer to data analytics. Hadoop, Hive are big data tools. Knowing these tools would help you to get a big data developer role. To get into analytics, you need to learn practical application of SAS /R /Python. Once you are comfortable with any of these tools, you should focus on how to apply statistical techniques with these tools. Great article I am curious to know if I do certification for Base SAS, what are the chances of getting into analytics field. I have 3 years of experience in IT industry. SAS Base certification alone will not help you land a job. At the end, you have to crack interview. To crack the interview, you need to have a good knowledge of how SAS is used in real time. But it's a good add-on to your CV. Need your help for telecom churn model. I have around 6-7 years of experience in MIS profile and currently I am doing a course in SAS and R from AnalytixLabs. So I just want to know do I have any scope in analytics field and from where will I get the datasets along with answers to practise in order to enhance my knowledge and get the job. Great article. I really appreciate your help. Keep posting more things that are related to Analytics and data science fields. I have overall 5.5 years of experience(4 years in BPO as Quality Analyst), with relevant experience of 1.5 years in SAS as data analyst in the same company. Now I wanted to switch the job as my salary is much lower as compared to my experience. I have basic knowledge of statistics (studied in graduation). Can I show all my experience in SAS or the part of the experience in CV to apply for the jobs? Can I show predictive analytics as well? But for that how I need to prepare? It would be great if you could help me in this regard.Eagerly waiting for your guidance. Thank you in advance. Hi Dipanshu. Could you share us the tutorial for Telecom Churn Model and CRedit Scoring with SAS ?